Postmenopausal women with osteoporosis are at greater risk for losing their teeth. A new study conducted by Case Western Reserve University School of Dental Medicine researchers examined what treatment for tooth loss provides women with the highest degree of satisfaction in their work and social lives. Their findings were reported in the Journal of International Dentistry. Participants were from the Case/Cleveland Clinic Postmenopausal Wellness Collaboration. The researchers used a 23-question survey to learn how replacement teeth affected their lives at work and in social situations. 237 osteoporotic women missing one or ore adjacent teeth (excluding wisdom teeth or third molars) participated in this survey and rated their satisfaction at work, with their health, and the emotional and sexual aspects of their lives. The lead researcher Christine DeBaz also personally interviewed each participant. 47 women had a removable denture, better known as false teeth, and 66 women had no restoration work done. The women with dental implants reported the highest overall satisfaction with their lives, those with fixed dentures scored next highest in satisfaction, followed by the group with false teeth and the women who had no restorative work done at all. Women with dental implants also reported the highest satisfaction in emotional and sexual areas, while those without restorations scored the lowest in those aspects of their lives. 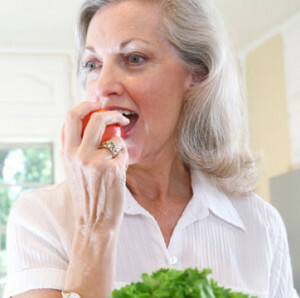 It is a matter of fact that missing teeth not only affect what we can eat, but they also affect how we feel. Missing teeth really do affect how we live our daily lives and relate to others. If you are conscious of your missing teeth and never smile, you may be judged as being mean. Missing teeth can affect our relationships, our careers, and how people remember us. If you are missing one or more teeth, call Dr. Grubb’s office today (410-939-5800) for a free consultation and learn about your options to become a healthier, happier you.